Okay, so you are thinking about your Google Adsense PIN (Personal Identification Number) which is must to get your payment, actually Google Adsense team even know about it that in India it takes longer to reach the PIN code, which is must for verifying your address and without verifying your address you can not get payment from Google Adsense right, okay then in this blog post your all problem related to your Google Adsense Pin will be solved just have patience and keep reading. As you are getting problem so don't worry I was too, because I was also eagerly waiting for Adsense PIN that's why I can verify my account, although this is not the first time I wait for something, actually it happened with me couple of times with different companies, sometimes to verify address sometimes to receive cheque from affiliate companies, now thanks to almost all companies those started paying in India through Paypal or direct bank deposit. Okay and also while receiving cheque from Paisalive.com and but I got cheque from them several times so that is not the issue after receiving cheque first time, because this company is based in India, problems always I faced when I had to receive something from outside India like I have given condition. Okay, let me tell you dear, actually most of the time its a location and putting address problem, so I have pretty good solution for you, I hope this will work because it worked for me, actually all the time I set my postal address not exact match with my Voter Identity Card, on the first two times in case of Google Adsense only but on other hand in case of Microworkers and ClickBank I have just put my postal address, it was not exact copy address of my voter ID even then I have received PIN from Microwers within in 20 days and cheque from ClickBank too the same, After looking at the need to article I have also written an article on this topic that is how many days taken to receive cheque in Indian from ClickBank. Okay after two times application for getting the PIN, I have put the exact copy of address which I have on the voter ID card and it happened within just 20 days I got call from my father that someone sent me a letter & I knew it was from Google I was happy and I told my father to give the letter to my brother in law and he sent me the letter through Whatsapp so, it was the fact of me to get PIN from Google Adsense. 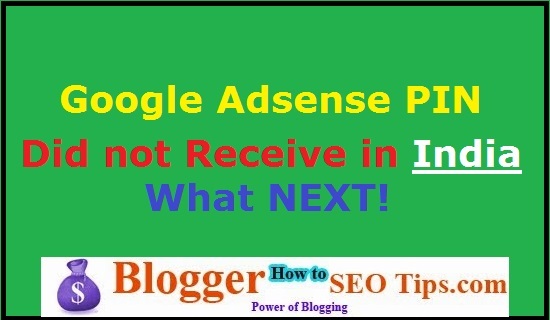 If you have read the whole article with proper concentration then I am sure you got the answer, even then let me share with you the way I have implement to receive my Google Adsense PIN India and I got it through post, may be if you will implement the same tips it work for you also. Okay, here is the tip, just put address there, exact address you have on your Voter ID card, if you can do it then it will be possible that you will get PIN and even then if you will not receive PIN from Google Adsense after even applied three times then just do one thing read my next headings. If You Did not Receive Google Adsense PIN Even After Applying Three Times What Next? Okay, its time for the knowing the alternative to verify your address on Google Adsense, okay dear after apply three times for Google Adsense, you need to wait for 4 weeks then you when you will click on the hyper link that is on "this form", just click there then you will see several option and you need to go through one by one, if you will face problem at this stage then comment below, I will try to help you to solve this problem. Then at the last you need click on submit then Google Adsense team will verify your address and then after verification they will send you an e-mail regarding your account address verification within 2 to 3 days. Okay, this is one of the funny section of this article, actually I did not mean to share with you what people are searching on this, I agreed to share this fact with you, because you are also one of them, who is belonging from blogging community. Okay, that's all from my side in this post, I hope you got answers of all questions going on your mind, okay this is also may be possible I missed something in this blog post, okay then let me know, I will try to write answer of your query too. Google Adsense PIN is really crucial to get paid from Google Adsense but yes they are also offering another method to approve your account but that is available to you only, if you have applied for the PIN for three times, after applying for receiving PIN three times and then just after 28 days you are eligible to verify your account manual through internet only. I hope; I have covered all those things those you required to verify your Adsense PIN in India, if you need any other help let me know? Yeah there are many those unable to find out right information, this is my real experience about getting PIN from Google Adsense.